One of the threads over at The Gun Thing talks about concealed carry revolvers. I started talking about mine over there. It’s the Smith and Wesson Model 60, the first revolver that Smith made in stainless steel. 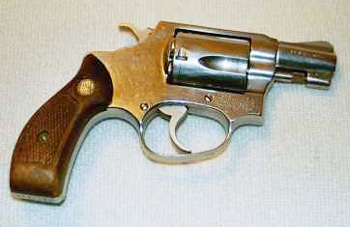 It is neither pinned nor recessed, and carries a two-inch barrel. It is altogether an excellent carry piece. Xavier probably wouldn’t like it much because it is stainless, but in the heat and humidity of Louisiana, stainless is my preferred metal for firearms that might be neglected. Back in the day, a trial commenced where one guy was accused of battering someone else with a firearm. That is a felony in this state. After the trial, and all the appeals had been finalized, the judge and evidence custodian were going through the evidence room disposing of old evidence when this revolver gained their attention. Fresh from the scene, it had been bagged in a clear plastic zipper bag and there was still blood on the frame and trigger guard. The little revolver was broken as evidenced by the fact that the hammer was halfway back and the trigger was misaligned with the frame. I happened to be walking down the hall when the Judge asked what he was going to do with it. I offered to take it. The judge tossed me the bloody revolver and told me to be at his office that afternoon. When I appeared later, he caused a minute entry to be made into the record, wherein that revolver was titled to me for the furtherance of law enforcement within the parish. Under the laws at the time, that was perfectly legal. All this was back before AIDS, HIV, or any of the more common blood-borne pathogens had been catalogued. I took the little revolver home, stripped it and washed it in the kitchen sink. I dried it and took it to the bench. After an inspection, I determined that the trigger guard was bent, binding the trigger and holding the hammer halfway back. I clamped the frame in a vise, grabbed the trigger guard with a pair of pliers, and pulled. The trigger popped forward, the hammer fell to rest. I took off the side plate and looked at the innards and convinced myself that the gun was okay. A trip to the range confirmed the proper function or the piece. The judge in question has since passed on to his mortal reward, after a distinguished career in jurisprudence, a long and happy retirement, and a legendary affection for sour-mash whiskey. The little revolver has been with me for over 20 years. I carried it during plainclothes assignments and since my first retirement and subsequent employment it has been my CCW piece. Sometimes it rides in a Don Hume beltslide holster, sometimes it is just dropped into a pocket. For ammo, I either load it with the old Federal Ny-Clad ammo or my own reload of a hollow-based wadcutter loaded backwards over a mild charge of Unique. I don’t use +P ammo in this little gun. While it is often difficult to rehabilitate a criminal, firearms don’t have as much problem. This pistol originally led a life of crime, but since became an honored member of the law enforcement community. It has assisted in countless dozens of arrests and has proved a deterrent to many other crimes. In 2001 I showed it to one young goblin. It was immediately effective as the goblin decided to depart posthaste rather than become more closely acquainted. I put it back in my pocket and went about my day unmolested. One of these days, one of my kids will have it. I am convinced it will serve honorably into the future.